Well can you believe it's yet another Project Challenge?! That means October is almost over...how can that have happened so fast?! I'm so glad to have you here today and share with you something my little boy has been wanting for quite awhile. 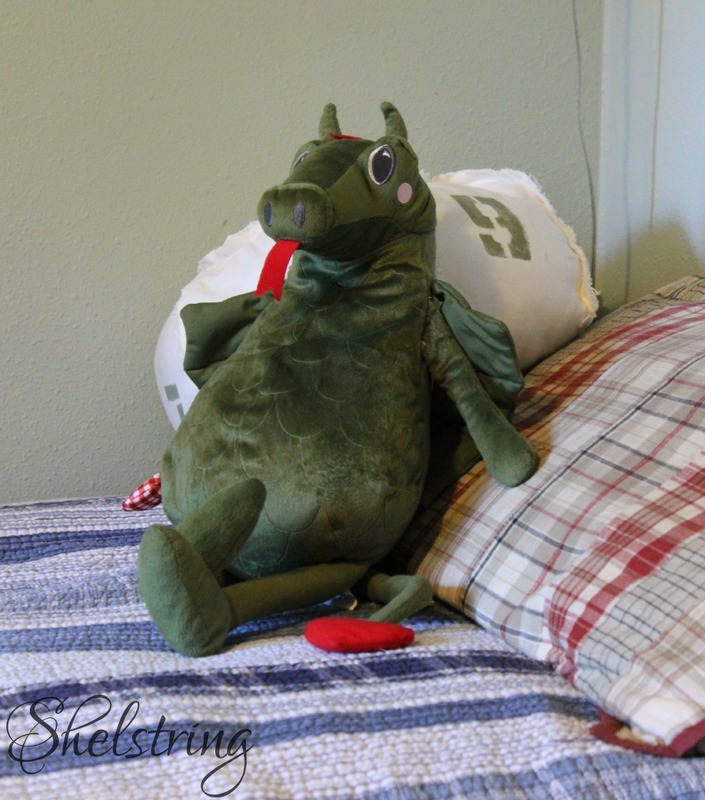 A couple years ago we sat down and brainstormed all the things we wanted to do to his room. Then, due to circumstances, he ended up sharing with one of his big brothers for awhile. Now, with two children having left home, we have a little space freed up. 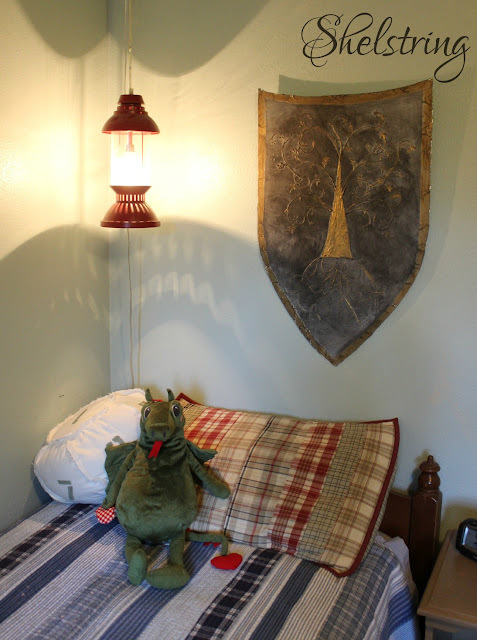 This made it possible for all of our boys to have their own rooms. Now my 8 year old and I are ready to encorporate all the ideas we had before, as well as a few more. 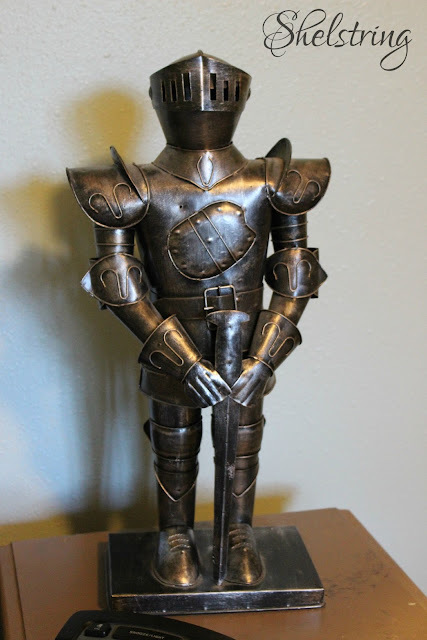 It all started with this neat statue he begged me to buy him one day while shopping at Ross. I couldn't refuse since this little guy hardly ever asks for anything. He loves the whole Knight theme. Horses, dragons blowing fire (this one is from one of my rare trips to Ikea), swords, maps, battle. His bedroom is basically a blank canvas. Plenty of space to do whatever we want to, though the room is the smallest of them all. 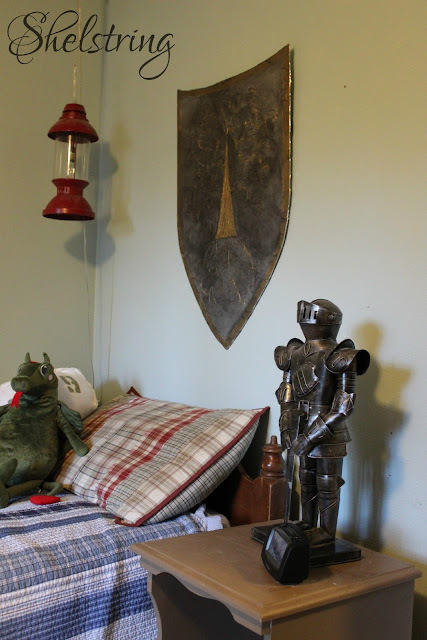 There was nothing above his bed, so we had decided to add a shield. It took me awhile of pinterest searching to find something that was suitable. That's where this idea came from. (to see the inspiration, you can go here). To make this, I cut out the shape I wanted from a cardboard box we had leftover from our air conditioner. 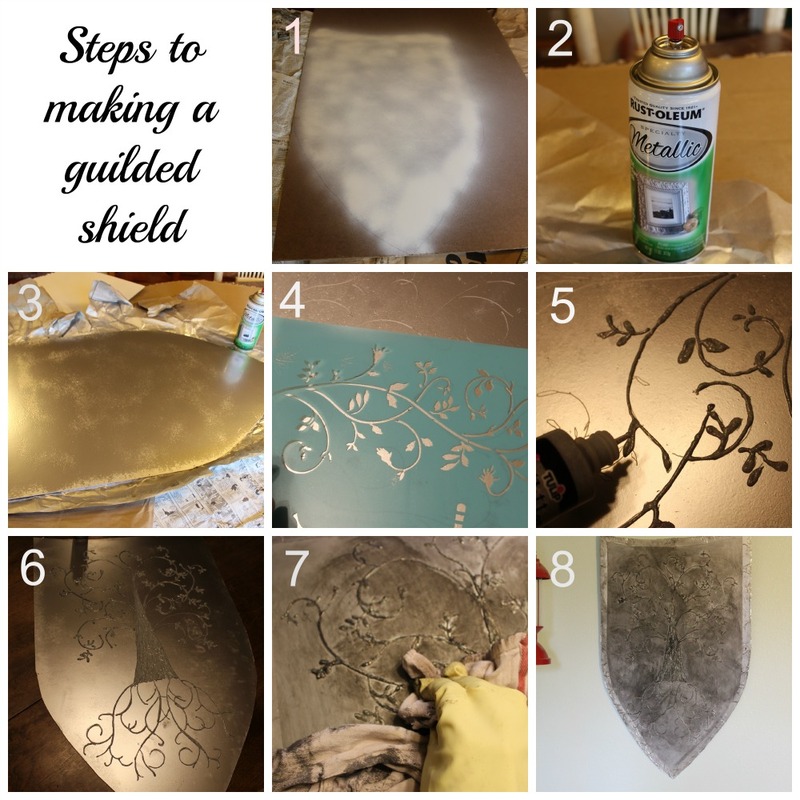 Here are the step by step photos of how I did it from there. 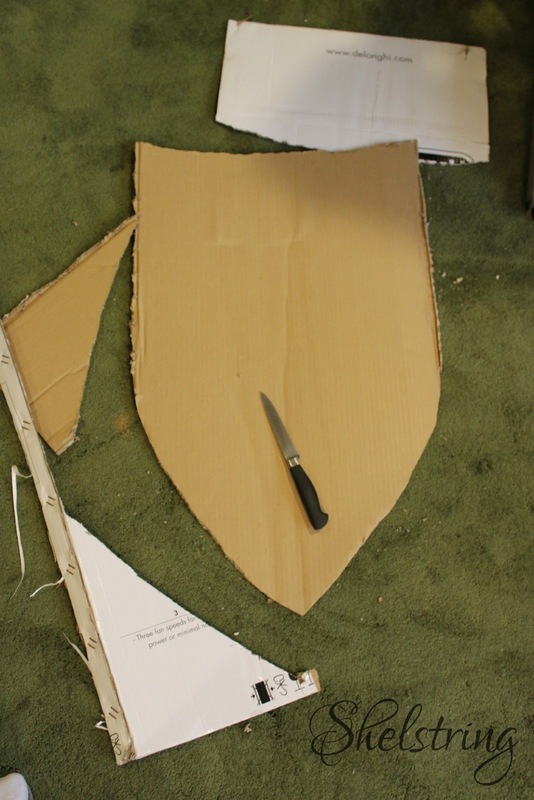 The cardboard was a template for the shield I actually made from a piece of dry erase board I had out in the garage. Any 1/8-1/4" board would be perfect for this project. 2 &3- Spray paint with silver metallic giving the whole shield 4-5 coats with an hour dry time in between. 4- Draw tree trunk and branches. I used this Martha Stewart bird stencil and eyeballed where I wanted the branches to be. 5- Trace over penciled tree with puff paint. 6- Let dry thoroughly. I let this dry over night. It was still pretty tacky after 2 hours from all the layers of spray paint and then the puff paint as well..
7- When dry, brandish using black chalk paint and a damp rag over the edges in swirling and swiping motions. Acrylic paint would probably work just as well here. 8- finish edges with HVAC tape. I let this crinkle a little to add a design. 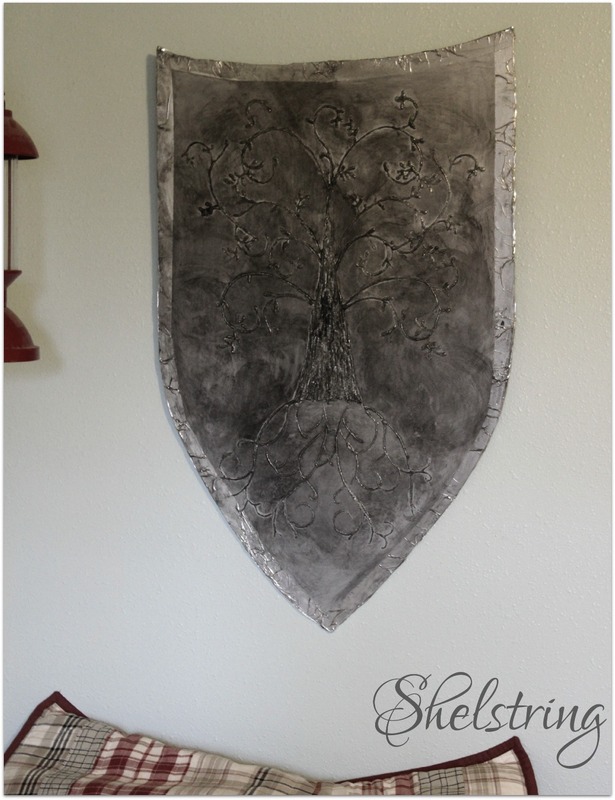 At first I just made it silver with brandishing to look old and used in battle (as shown in the picture above), but I felt like it lacked a contrast, so I added some gold leaf rub and buff to the HVAC tape around the edges, as well as the tree, and went over it again with a wash of chalkboard paint. It stands out a lot more with the gold. I was not very careful with the HVAC tape (as you can see). This wasn't a concern to me because of the nature of the project, but it was also my first time using HVAC tape. To be honest, if I were to do it again, I would use a little more care and control. When the reaction you hear when your son sees it for the first time is "COOL!!! ", then it doesn't really matter how "perfect" it didn't turn out after all anyway. Thanks to this challenge, I think we're off to a good start. Michelle - The gold accent adds so much! I bet your son loves it. Great idea! This is so cool! I love the tree design on it. 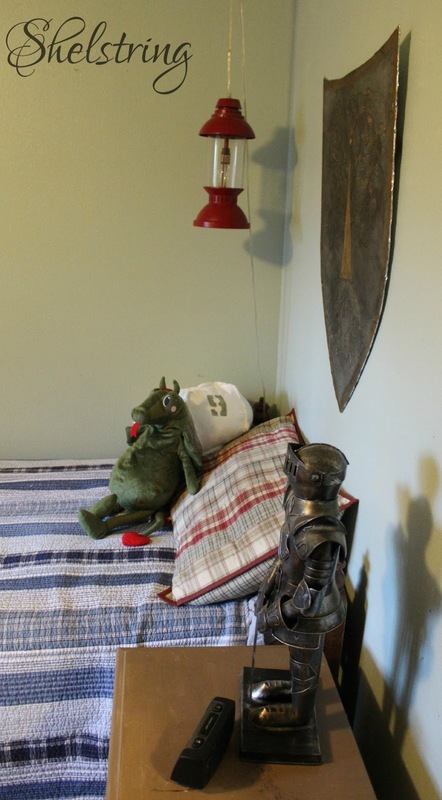 What a wonderful way to add a little flair to your sons room. I'm glad I had the stencil on hand because what I was free-handing wasn't coming out so well! Haha, but thank you, it was a lot of fun. Michele this is so totally awesome! I love the addition of the gold and I LOVE that you created this for your son :) It's so fun when our kids want us to create something for them and then love it when we are finished with it! For some reason, I'm always relieved that they love it so much in the end. I think their enthusiasm and excitement is what compels me to do more for them time and again. Michelle, oh yes this looks so awesome ...and soooo super super creative. It looks like a lot of tedious work!!!!! Love it! 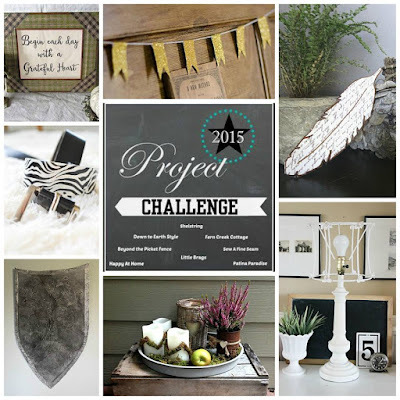 A perfect prop for the room--very crafty! Thank you Becky, fun to use puff paint again--it amazes me. The experience with the tape made me feel like I'd like to try it on something else sometime, so we'll see! 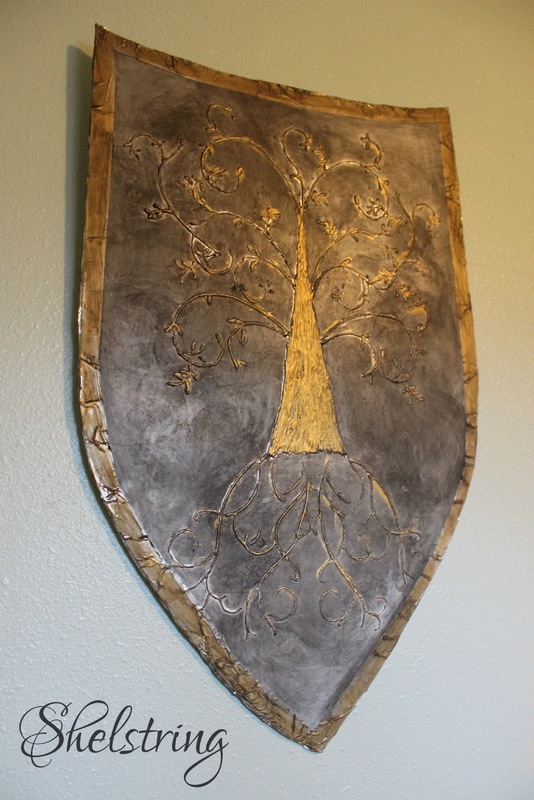 My son would love a shield like that! And the gold was definitely the perfect addition. It looks old and regal. Thank you for saying so! 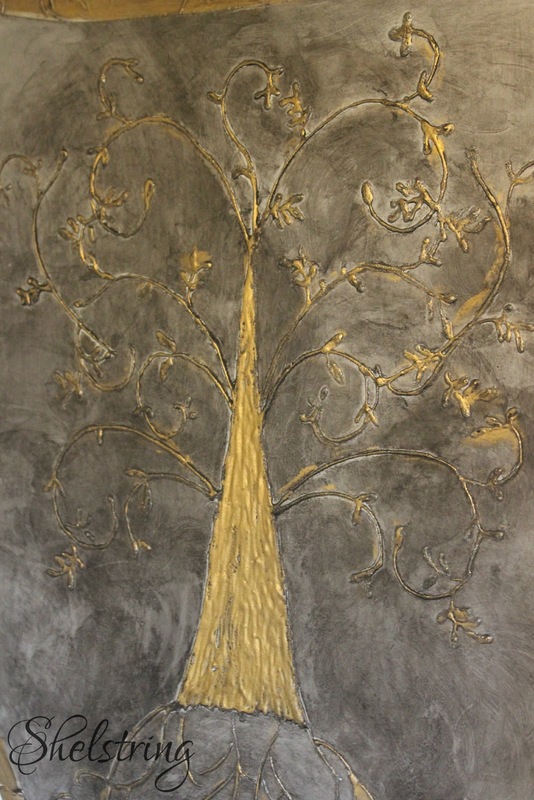 I wasn't sure if I'd like the gold, but I have to agree, I do think it makes a better statement on the wall with the additional color tone. How fun and creative is this... I bet your son loves it! Just so creative and really looks wonderful. Awesome creativity on this. Oh my goodness....I looooove this!!! It is so cool!! My oldest son had a knights themed room when he was young so this brought back some happy memories for me. 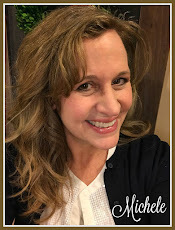 I would love to see what ideas you encorporated Lisa!